Powell, J.v.. "Tsimshian". The Canadian Encyclopedia, 16 October 2018, Historica Canada. 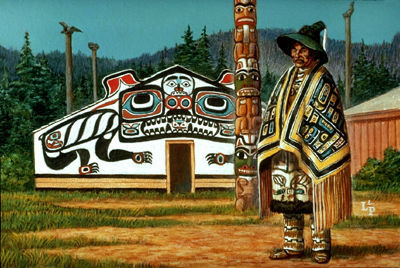 https://www.thecanadianencyclopedia.ca/en/article/tsimshian. Accessed 18 April 2019. Tsimshian (Tsim-she-yan, meaning “Inside the Skeena River”) is a name that is often broadly applied to Indigenous peoples of the Pacific Northwest Coast, speaking languages of the Tsimshian language family. In the 2016 census, 2,695 people reported speaking a Tsimshian language, with the largest concentration (98.1 per cent) living in British Columbia. Another 5,910 people claimed Tsimshian ancestry. 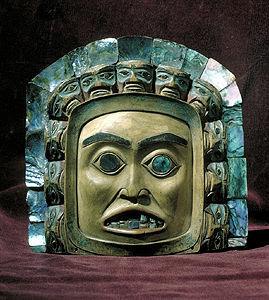 Tsimshian wood and abalone frontlet, British Columbia. 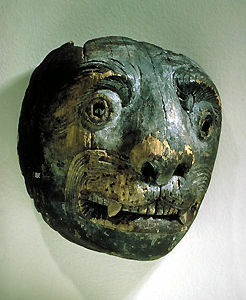 Tsimshian wood mask, Metlakatla village, British Columbia. 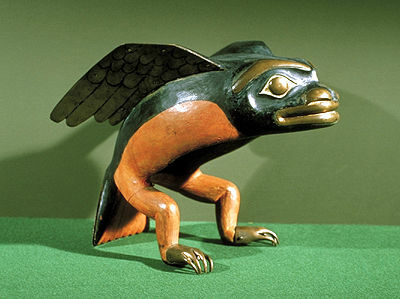 Tsimshian carving, "Flying Frog Headpiece," made of wood, dating to the mid-19th century. 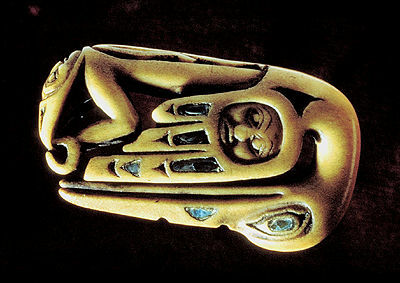 Tsimshian shaman's charm, made of bone, from the Nass River, British Columbia. Tsimshian communities are found in Terrace and Prince Rupert, British Columbia, and in southern Alaska. In the 2016 census, 5,910 people claimed Tsimshian ancestry. Archaeological excavations in the harbour at Prince Rupert have unearthed the remains of cedar plank house villages that date back 5,000 years; as such, the Tsimshian claim one of the oldest continuous cultural heritages in the Americas. (See also Architectural History of Indigenous Peoples in Canada.) 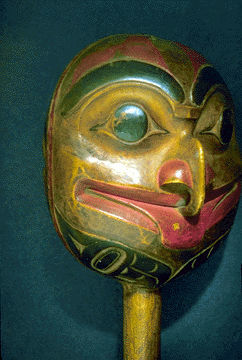 Tsimshian peoples are also generally held to be related historically to the Penutian peoples of Oregon and California. The Tsimshian, along with the Tlingit of Alaska, British Columbia and the Yukon and the Haida of Haida Gwaii, represent the Northwest Coast cultural area, characterized by carvings, such as totem poles and traditional ceremonies, including the potlatch. Taking pride in their heritage, the Tsimshian continue to practice certain cultural customs, such as hosting community ceremonial feasts to celebrate name giving, marriage, divorce, adoption and funerals. 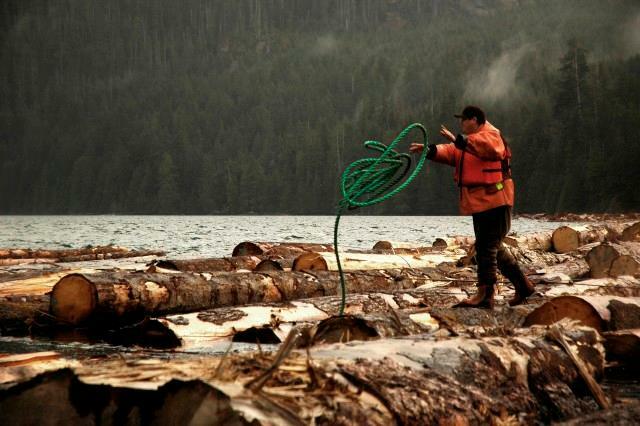 Although few Tsimshian continue the traditional practice of trapping for a living, fishing remains an important part of their economy. Tsimshian society was originally matrilineal, with descent traced through the female line. Tsimshian society was also based on a moiety ( clan system). Each Tsimshian still recognizes himself/herself as belonging to one of four phratries (tribes or totems): Frog or Raven, Wolf, Eagle, and Killer Whale or Fireweed. Tsimshian individuals belong to the same phratry as their mother and traditionally marries someone (historically, the preferred mate was a cousin) from a different phratry than their own. Hereditary, chiefly titles are still maintained by both men and women for ceremonial purposes. Tsimshian (meaning “Inside the Skeena River”) is a name that is often broadly applied to all Indigenous peoples in northern British Columbia, speaking languages of the Tsimshian language family. In the 2016 census, 2,695 people reported speaking a Tsimshian language, with the largest concentration (98.1 per cent) living in British Columbia. In 1862, Anglican Missionary William Duncan established the Christian settlement of Metlakatla in British Columbia. (See also Missions and Missionaries.) Approximately 350 Tsimshian people from Port Simpson joined Duncan in Metlakatla. In 1887, Duncan and about 825 Metlakatla Tsimshians founded the new community of “New” Metlakatla, near Ketchikan, Alaska. As Europeans increasingly encroached on Tsimshian territories, the Tsimshian found themselves forced onto smaller parcels of land. (See also Indigenous Territory.) As a means of assimilating Indigenous populations, the Canadian government sent Tsimshian children to residential schools, where they and other Indigenous children were forbidden from speaking their languages and practicing their cultures. Officially launched in 2008, the Truth and Reconciliation Commission of Canada (TRC) sought to guide Canadians through the difficult discovery of the facts behind the residential school system and to lay the foundation for lasting reconciliation across Canada. In 1988, the Tsimshian created the Tsimshian Tribal Council to negotiate with the British Columbia and federal governments on behalf of seven of the Tsimshian bands: Kitselas, Kitsumkalum, Gitga’at, Kitasoo, Metlakatla, Lax Kw’alaams and Gitxa’ala. (See also Indigenous Land Claims.) In 1991, the council officially entered the British Columbia treaty process. Negotiations stalled during the negotiation of the agreement-in-principle. In 1997, a framework for a comprehensive treaty agreement was established between the original seven bands and the Government of British Columbia. In 2004 a new negotiating council — the Tsimshian First Nations Treaty Society (TFN) — replaced the Tsimshian Tribal Council to represent five of the seven original members in the British Columbia treaty process: the Gitga'at Nation, Kitasoo/Xai'xais Band, Kitselas Band, Kitsumkalum Band and the Metlakatla First Nation. The TFN continues to work towards self-government and the protection of territorial, economic and political rights. Helen Raptis, What We Learned: Two Generations Reflect on Tsimshian Education and the Day Schools (2016). Margaret Seguin, ed., The Tsimshian: Images of the Past, Views for the Present (1993). Christopher F. Roth, Becoming Tsimshian: The Social Life of Names (2011). BC TREATY COMMISSION Learn more about the Tsimshian and their efforts to negotiate modern treaties. Tsimshian First Nations Treaty SocietyNews, publications and other resources related to the work of five Tsimshian First Nations in Northwest BC working to achieve treaty agreements with Canada and British Columbia under the BC Treaty Commission process.